Sometimes it’s difficult deciding where to go for dinner. It doesn’t help when your friends have standard answers of ‘Anything’ ‘Up to you’ ‘Also can’ when you ask them what they want to eat. Somehow or other, I always end up making the decision which can be good or bad, good because I get to go to the restaurant of my choice, bad because I always feel personally responsible if the food turns out bad. As usual it was a ‘up to you’ night with the only request being ‘can the restaurant be an entertainment card thingy’. Since we were planning to go to San Churro in Fremantle for their chocolate desserts, I picked Villa Roma in Freo for our dinner venue. It was once voted one of the top 55 restaurants in Perth by STM so I was quite hopeful. The restaurant itself was warm and bustling, we had to wait about 10 minutes for a table which is usually a good sign. 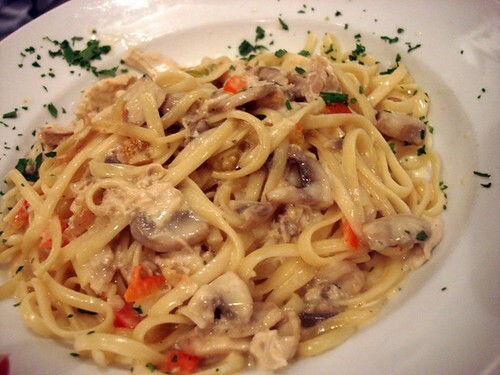 The waiter recommended Linguine Al Pollo ($19.90) to Adrian which came with chicken, mushrooms, roasted capsicum and cream. I didn’t try this but I think Adrian said it was alright but not flavourful enough. 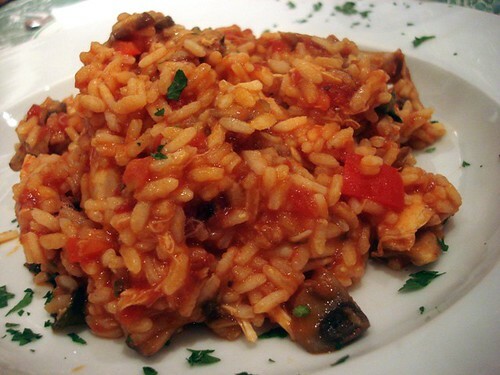 Amy had the Risotto Al Pollo ($19.90) which was a tomato based chicken and mushroom risotto. This tasted just ok texture wise but I’ve been spoilt by risotto at Ciao Italia and this just didn’t make the cut. 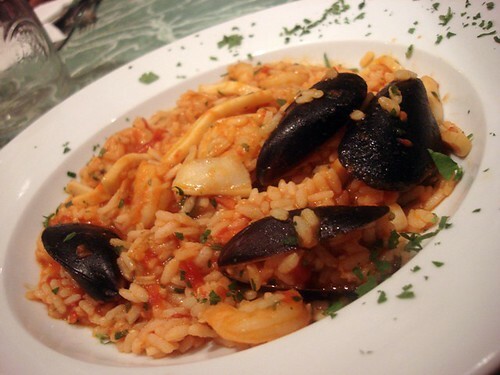 Bryan’s Risotto Pescatore ($21.90) was seafood risotto with garlic, butter and tomato sauce. Taste wise it was rather bland, but worse of all, the portion was so miniscule, it really was just a thin layer of risotto and that was it. Just compare it with the portion that Amy had! 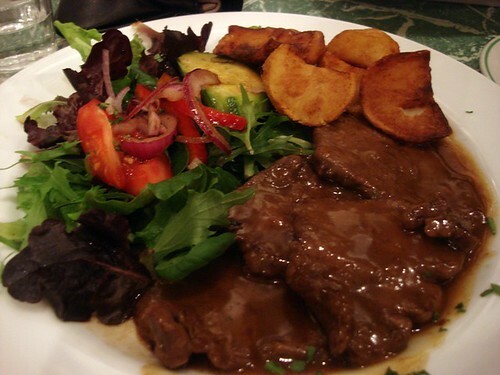 Mine was the Scaloppine Marsala ($28.90) which is thinly sliced fillets with marsala wine sauce with a side of salad and roasted potatoes. The salad and potatoes were ordinary, but I quite liked my fillets which were tender and the marsala wine sauce which was sweet and savoury. 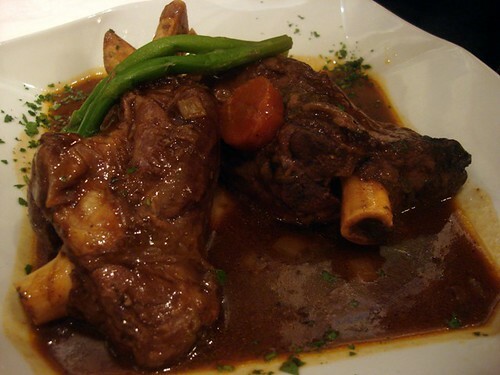 The start of the night was Richard’s Lamb Shanks ($24.90) which was braised lamb shanks with roast potato and asparagus in red wine and mushroom jus (one of Villa Roma’s most popular dishes). The portion was generous and the lamb shanks were braised till tender, the red wine and mushroom jus was nice too, but I would have preferred stronger flavours. Still, it was a good and hearty dish. We all shared the Tiramisu (the website says $6.00 but I think it was more $8.00) which was made with mascarpone cheese (I hate it when people use cream as a substitute) but the sponge fingers weren’t soaked well with expresso and it was just missing that something that makes tiramisu so yummy. Overall the guys thought that Villa Roma deserved a 6.5 in terms of food but a 7 for their lamb shanks and 8 for their service. I must mention that their service was great, the waiters were personable, attentive and very friendly. I also liked it that they asked us whether we prefer tap water or bottled water, unlike the Italian restaurants nowadays that serve you mineral water ($3 – 4 for a bottle) when you ask for water. I’ve decided to give Villa Roma a 6 instead just because I feel the food was really just average (but the lamb shanks deserve a 6.5 – 7), and Hanami was really a lot better compared to Villa Roma.Haha, I can’t believe I’m taking this ratings thing so seriously. Weekend over in a flash, another long long work week ahead. Friday evening I found myself locked outside my home for a good hour before Jo came home to rescue me. As usual, daitaoha didn’t bring her house keys to work. Dinner at Villa Roma (in the faraway Freo) with friends, the food wasn’t great but the service was superb (will blog in future). 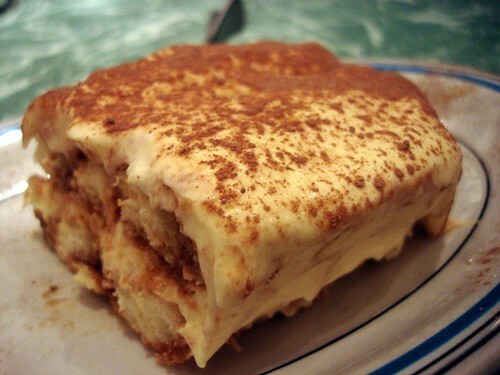 The tiramisu, sadly, didn’t even come close to Ciao Italia’s version. Skinny flat whites with the guys at Soto in Mt Lawley afterwards. Saturday I went shopping alone and didn’t spend a single cent. Surely the best kind of shopping. 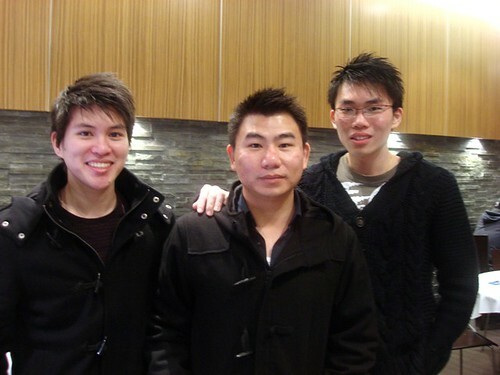 Late night dinner/supper at the newly opened HK style cafe on William Street with men in black. 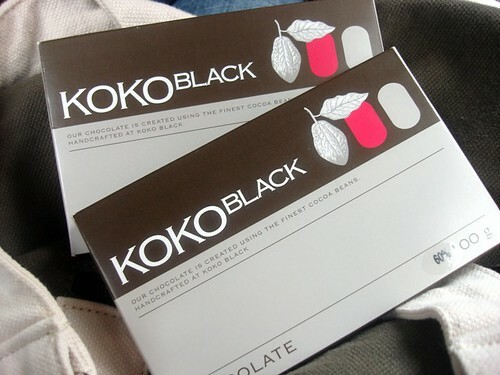 Present from Calv from Melbourne, good chocolate from the famous Koko Black. Sunday afternoon, cooking Jo’s lunch for the next day, my version of Kuching’s Taugeh Mee a.k.a. 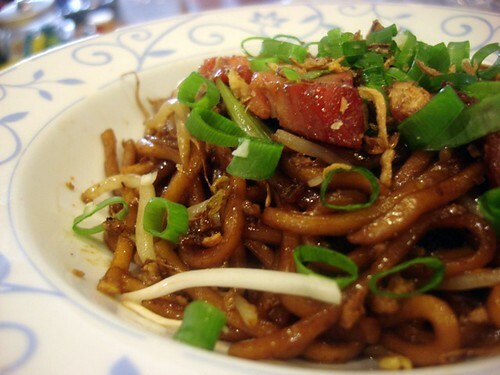 beansprouts noodles. I call it Tee Mee (as in sweet noodles) because it’s sweet and sticky. 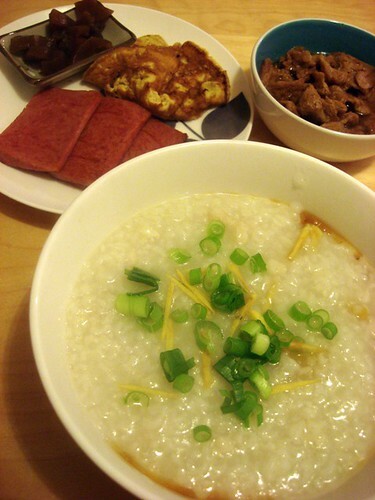 Ssssh… don’t tell Jo but the congee for dinner tonight had fish in it! I masked it with lots of ginger and sesame oil plus minced the fish so she wouldn’t spot it, seemed to work well. Why are we eating sick food? Sunday evening I received a phonecall from Jo to say that she’s coming out in rashes. According to the GP she’s developed a viral infection, I suspect it’s fatigue from coughing, going out and working. Jo is pretty much going through what I had last year, an entire month of cough and flu. So far I’ve managed to stay strong despite all my sick friends and colleagues, but I’m starting to feel body aches and developing headaches. Arrgh, I absolutely cannot afford to fall sick and stay home from work. And so Monday is over, I’m already starting to plan my weekend, anyone up for a Sunday excursion to Alfred’s Kitchen for the best burgers in Perth? I’ve propably mentioned this about a thousand times, but I really really love Japanese food. I’m not sure how to explain why I love Japanese food so much, I love how the Japanese toil over the perfect ingredient, their love (or perhaps obsession) for fresh, healthy and seasonal ingredients, the sweat and tears of honing the best techniques( watch the movie Tampopo about perfecting the ultimate ramen and you’ll get a clue), the sharpest knives, the gorgeous utensils, the delicate portions. When it comes to Japanese food, it’s the whole picture, it’s not just about the food, it’s also about respect for the ingredient, for the season, presentation is the key to everything, not only must it taste good and be good for you, it must also look beautiful. When I went to Japan, I was only a young kid and wasn’t very excited about Japanese food. Now that I’m older, I can only imagine how fantastic the food in Japan must be, just looking at the pictures from my sister’s annual Japan trip transports me into throes of wonder and amazement (plus salivation). 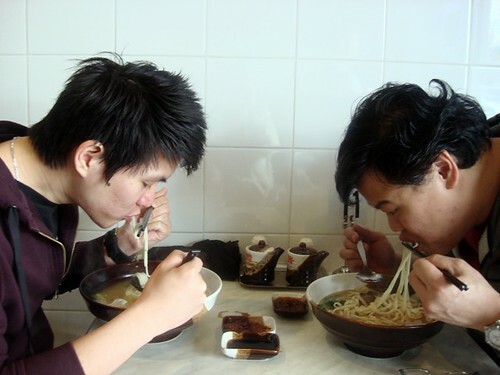 Japan is my ultimate ‘must-go’ foodie place before I die, maybe year 2010? Here’s hoping. 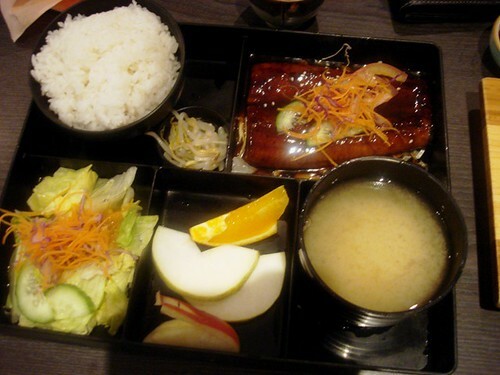 In Perth, there ‘s quite a bit of Japanese food around, but none that transport me into foodie heaven. Sadly, a lot of Japanese restaurants either fall into the ‘not authentic Japanese (more like Malaysian chef) but good for a quick sushi fix’ category or into ‘overly expensive need to eat McD afterwards’ category. So I’ve decided to start on a quest for the best Japanese in Perth, first round, is Hanami at Mount Lawley. 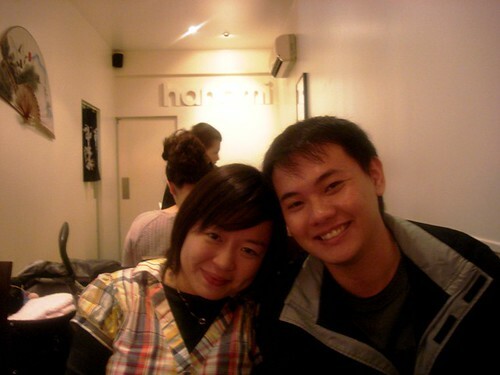 Jo and Hieng Chiong at Hanami, the surroundings are not particularly posh, more of a family restaurant feel I suspect. I’ve been to Hanami twice now, but am always reluctant to blog about it because I take the most ugly pictures here. I don’t know what it is, dodgy lighting or just my shaky hands, everything looks ugly, so here’ a warning in advance. The food tastes better than it looks. Beef tataki or raw beef salad entree. 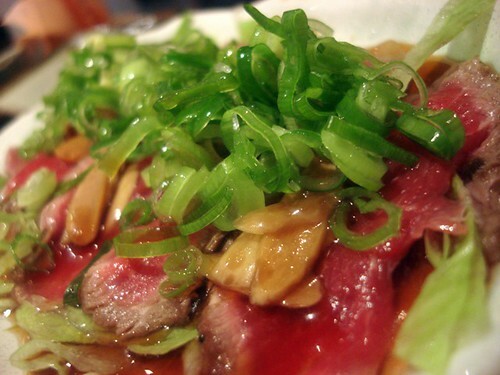 I’m not such a fan of beef tataki, but Gill is, and she said it was one of the better ones she’s had. The dressing was nicely vinegary and tangy, the beef tender and nicely pinked in the middle. 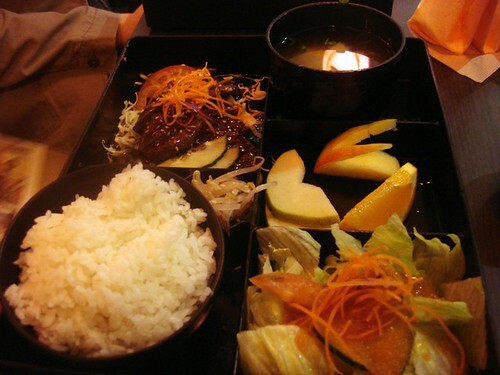 Teriyaki beef bento. I can’t remember most of the prices now but most of the bento boxes are under the $20 mark, so pretty good value for money. 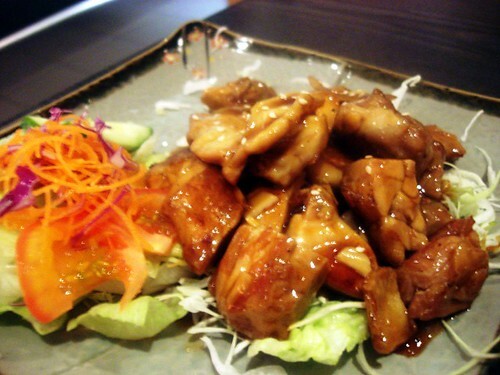 I remember comments that the teriyaki beef was tasty and tender. 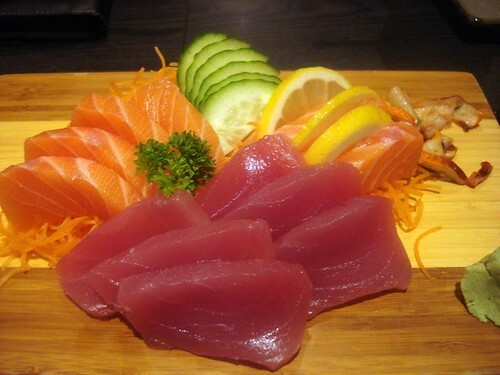 Mixed sashimi platter, thick slices of sashimi, all fresh and good. 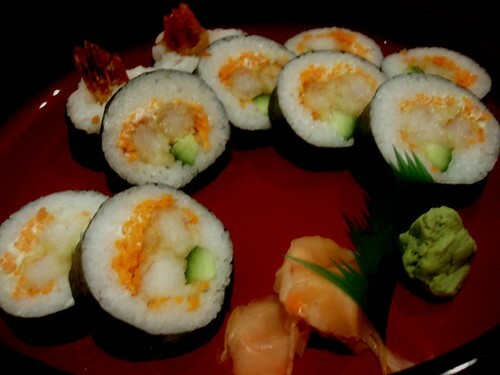 Prawn tempura sushi. I know the sushi was made by order, because the rice was still rather warm when it was served to us, a bit odd, but still tasted quite good nevertheless. Hanami serves teppanyaki, on two separate occasions we ordered the teppanyaki beef and chicken (featured above). The beef was alright, not very flavourful but nicely grilled. Teppanyaki chicken felt like homecooked food, saucey and sweet, went well with rice but didn’t feel very grilled to me. 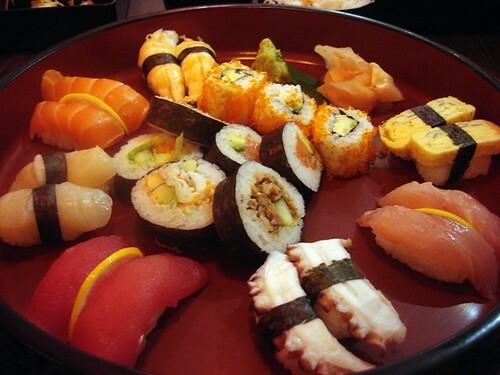 Mixed sushi platter, not outstanding but not bad either. 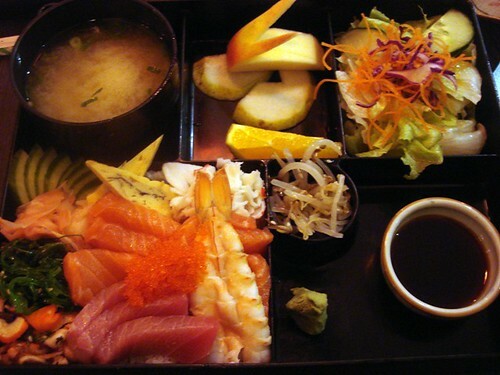 My must-order at all Japanese restaurants, the chirashi sushi bento. Generous portion, good sticky sushi rice but not as good as Zen’s chirashi sushi. 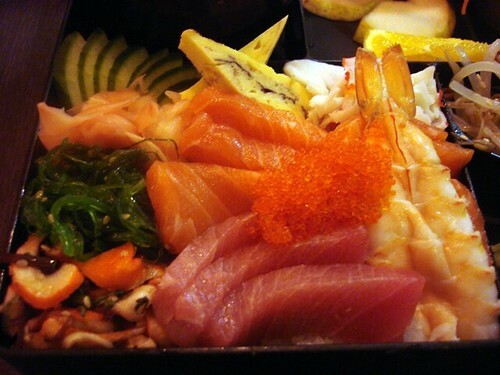 A close up shot of the chirashi sushi.Thick slices of sashimi. Jo’s must order at Japanese restaurants, the unadon. The unagi here was alright, a little bit chewy I thought, I wonder what unagi from those specialised unagi shops in Japan taste like? Yums. 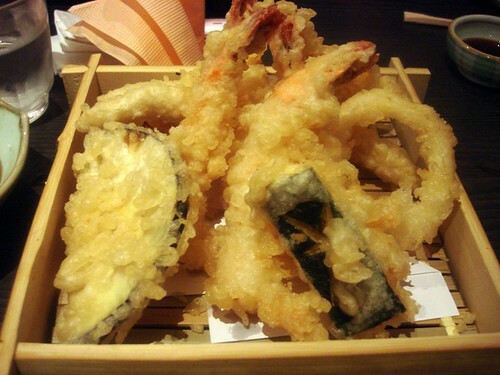 Mixed seafood and vegetable tempura . Nice mix of vegetables and tempura, I think they had pumpkin and sweet potato tempura which are my favourite tempuras, I didn’t eat any of the seafood tempura so not sure whether they were any good, comments Jaso? Overall, Hanami falls into the pretty affordable but might not be overly authentic category.This is a good place to go to when you’re craving a nice substantial bento box, tasty Japanese food which won’t break the bank. It’s not a ‘flowers and stars coming out of the head’ experience, but like I’ve said, I’ve yet to experience Japanese food of that category anywhere in the world, still, I would definitely return. Grey Hoodie boy wasn’t on my bus today. It was drizzling and I wondered whether he would be caught in the rain. I was reaching the lights in front of my building when it started raining heavily so I ducked under the roof of a building for shelter. Suddenly, Grey Hoodie walked right past me and stood at the lights. I don’t know why it still surprises me when I see him but it does. The lights turned green and I walked ahead with my umbrella, he turned and saw me and smiled ‘hello’. I shared my umbrella with him while we crossed the road in silence. I told him that he should use his hoodie to cover his head but he said he was ok. Then we said goodbye and I went into my building. My Grey Hoodie boy encounter of the day ends there. Are you all sick of reading about Grey Hoodie boy yet? Because I feel slightly stupid and silly for blogging about him and really should stop. I swear it’s really not as romantic as it seems.I think of us as strangers that somehow know each other. Today it struck me, I call him the Grey Hoodie boy because he’s always in a grey hoodie. So do you think he calls me ‘The black coat girl’ because I’m always wearing my black coat? I think it’s more likely I’m known as ‘The girl who fell’. I watched Harry Potter with the boys last night, while it was quite good, it didn’t live up to my expectations. I guess all that hype about it breaking the box office record of all time (won The Dark Knight) made me think the movie must be spectacularly good, it was an easy watch, but I wasn’t blown away. Still I love love watching movies in the cinema so I really enjoyed myself. My home cooking has a Japanese theme this week! I thought Jo was going to work today so I prepared her bento box the night before. 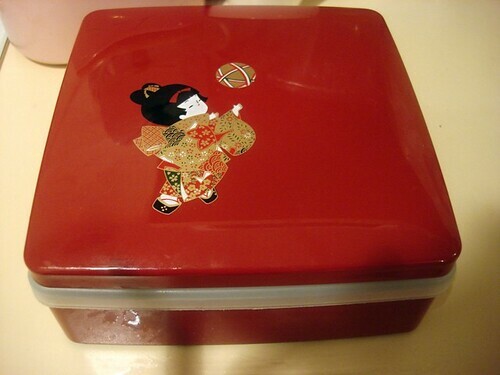 This is the same bento box that I used for H’s bday bento in a different design, I love pretty and cute bento boxes, they make lunches so much happier. 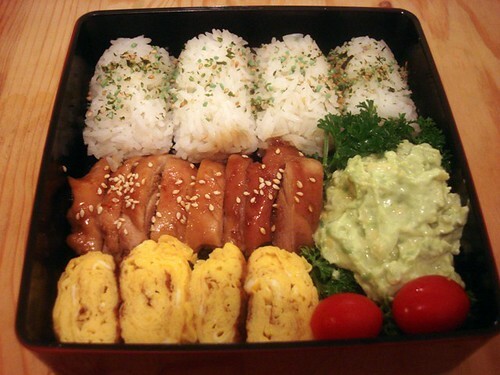 My ‘lazy’ bento box of foolproof teriyaki chicken, tamagoyaki with rice topped with wasabi and seaweed seasoning. I also made some avocado, mayo and lemon juice mash to go with the chicken. Despite talking about trying new recipes etc. I’ve been so lazy this week and copping out with my lazy cooking. 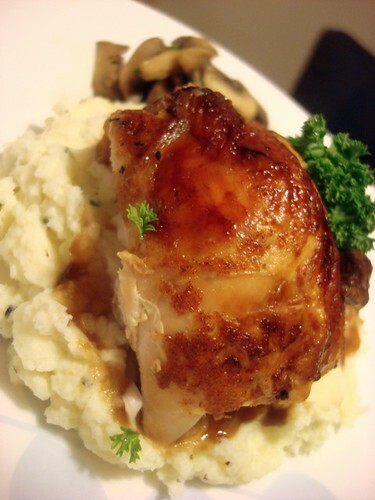 Dinner tonight was store bought roast chicken on mashed potato with grilled butter mushrooms. I read Jo’s blog about craving fast food and wanted to roast some potatoes for her, but the first thing I heard when I reached home was her coughing away in the bedroom. So I made mashed herbed potatoes with light sour cream and a bit of mascarpone instead. Jo was all excited when I got home saying ‘you’ve got a parcel! Quick open so I can see what it is!’ It was a parcel from Shirley! 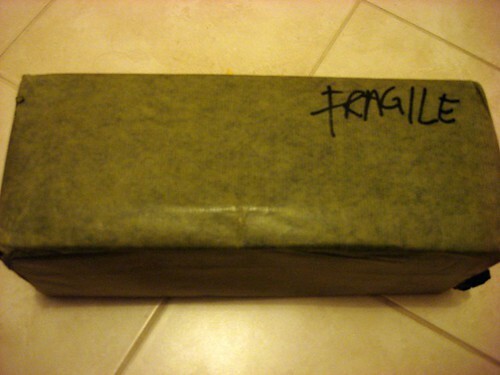 I was rather surprised to receive a parcel from Shirley because it’s not my birthday or any special occasion. Guess what was inside? 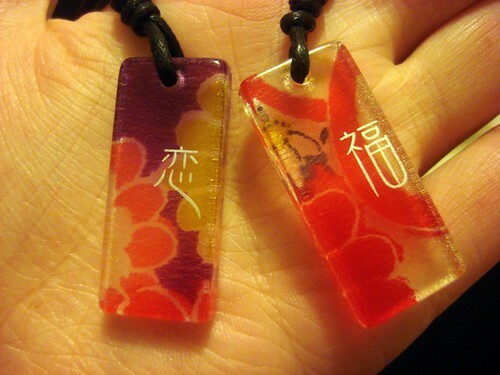 Necklaces for me and Jo, I decided Jo should have the ‘Fu’ one because she needs prosperity while I should get the ‘Lian’ one since I need romance! Thank you Shirley (^___^). That wasn’t the end of it. 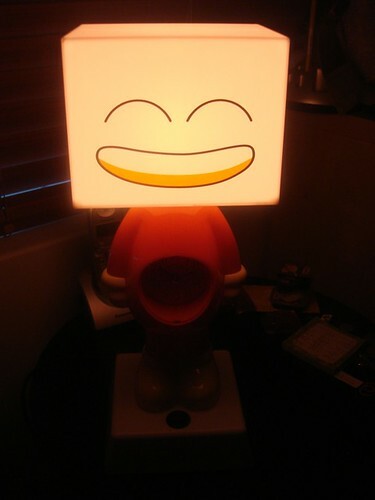 Shirley bought me a cute lamp, a smiley happy looking one which is what I look like when I eat something really yummy. It has two expressions, this one is more me when I’m watching a sad movie and about to cry, haha, except my eyes are not so big. Thanks Shirley, it was a great surprise, it’s so nice to get an unexpected present, sometimes I think those presents are the best of all, touched lah. And that ends my Wednesday, two days to Friday and counting! The Grey Hoodie boy was on my bus today. He was sprinting to get onto the bus again and made it just in time. Still in his grey hoodie (^_^). When he locked eyes with me, he gave me a big grin so I smiled back as well. During our bus journey I thought ‘Nah, I can’t talk to him’. 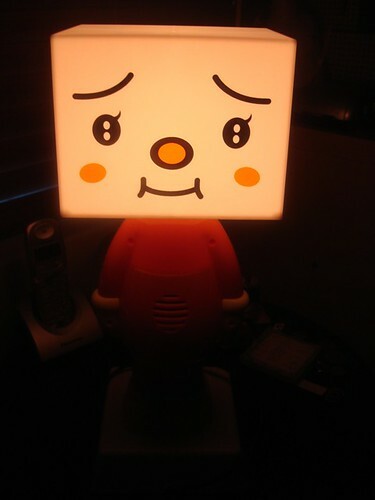 Despite all my bravado, I’m really a shy person at heart, sorry guys, couldn’t use your pick up lines(= ^_^=). At the lights, I was extra careful on the slippery pathways just in case I fell again (very likely scenario). To my surprise, Grey Hoodie boy walked towards me and said ‘How’s your hand?’ I stammered ‘ Oh, it’s fine, just a sore back’ and showed him my hands. Showing him my hands, what was I thinking?! Luckily the lights turned green and he said ‘Gotto go, see ya!’ gave me a wave and walked briskly ahead. I thought that was a bit odd because I know now that he usually walks down the same stretch of terrace that I do, maybe he was running to catch a bus again? Anyway, not wanting to act like a stalker, I didn’t try to catch up with him and was smiling to myself while thinking ‘I bet Jan and mum will love this story”. He was at the lights in front of my building again. I thought ‘I should ask him where he works’ but decided to stay put. But then he walked to me and said ‘where do you work?’ Aaaaaah, he took the words out of my mouth! So I told him and I now know where he works, which is not far from my building. He said that it was a pretty long walk from our bus stop but good for exercise. I said that I had seen him walking in front of me before and he said he’s noticed me walking around the city as well. So paiseh. Then in front of my building, we exchanged names, shook hands and bided each other goodbye. Thunderstorms and hailstorms make me want to hide in my bedroom with a steaming plate of hot curry and rice, one of my favourite winter comfort food. Usually I like to cook my Japanese curry with beef brisket which requires hours of braising but is gorgeously tender and flavourful when added with the curry sauce. But today’s curry was more of a vegetable curry, there were chicken pieces in it but mostly lots of carrots, onions, enoki mushrooms and butter mushrooms. I overcooked as usual and ended up with a large pot of curry, so I thought I would prepare Jo and Hieng Chiong’s lunch bento tomorrow. 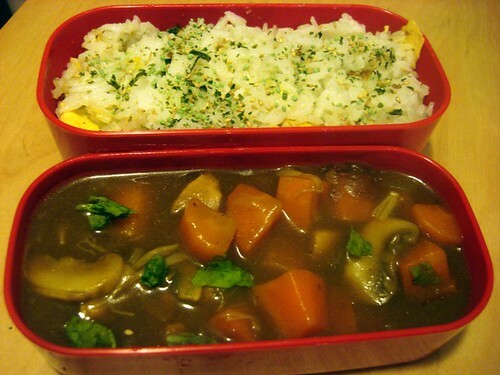 Jo’s lunch bento tomorrow is wasabi seaweed seasoned egg rice with Japanese curry. 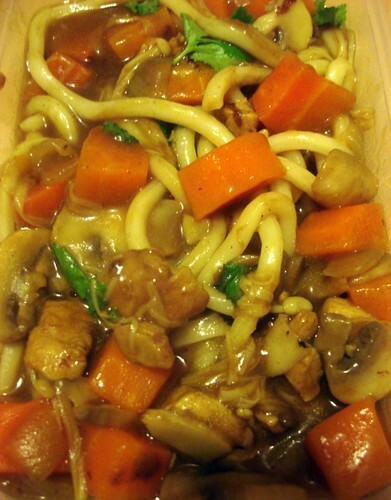 Guys usually prefer noodles, so Hieng Chiong’s lunch bento is chicken curry udon. I hope he likes it. 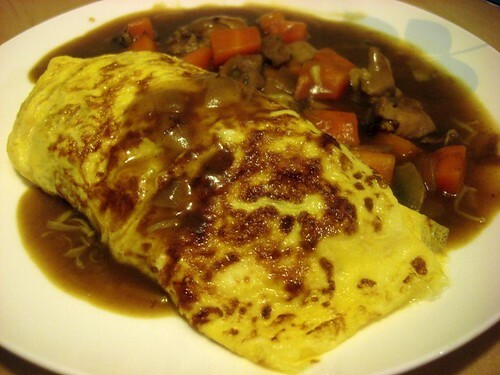 Dinner tonight is omurice with Japanese curry, it’s been a long time since I’ve made omurice, I fried the rice with some tonkatsu sauce, egg and seaweed seasoning and wrapped it with an omelette which was a mixture of mirin, sugar and egg. 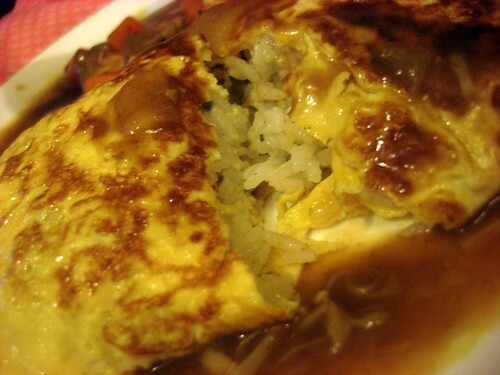 In the past I used to wrap yakisoba with omelette and top it with mayo and tonkatsu sauce, quite yummy. I’m going to try making cold soba soon, but only if it stops raining (-_____-). Ok, going back to watching Top Chef now, I’m getting addicted!